These stories were written by Russel Sim, Linda’s Syddick Napaltjarri's husband, as dictated to him by Linda as the artworks were created. Kangaroo Man was one of the ancestral spirits from the dreamtime. These spirits had the gift of morphogenesis. They could change their shape from being amorphous and unseen to the physical shapes of animals and birds. Kangaroo is a man’s dreaming, and part of it forms the law describing how a kangaroo should be cooked, with fierce penalties applying to any man not following this edict. This is complied with even today, and determines all the aspects of dealing with and sharing out all part of the kangaroo once it has been killed. 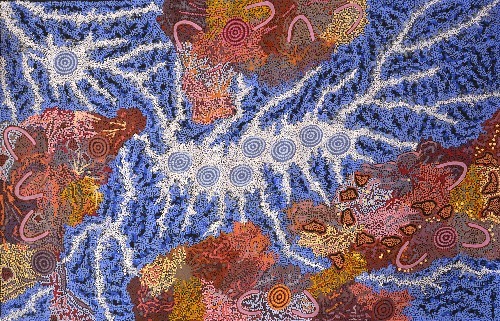 Linda’s Father, Rintje Tjungarryi , was descended from the Ancestral Kangaroo men and therefore owned many of the stories and dreamings associated with them. Before he died in 1985, Shorty passed on many of the stories and permission to paint them to Linda. ; In turn, Linda will hand down this information to a young member of her own family. In this way, part of the spiritual background of Aboriginality will be preserved as a lasting testament. Linda was born at Lake Mackay in the Gibson Desert, in 1937. This lake straddles the borders between Western Australia and the Northern Territory. The area was the Homeland of the Pintupi people for thousands of years. When Linda was a baby, her father, Rintje Tjungurrayi was killed by a revenge spearing party. This story was told to Linda by her mother, Wanala Nangala. It is about herself and Rintje when they were young, long before they became husband and wife. It was coming on night time in the Gibson Desert, Rintje and Wanala were sitting down with a coolomon containing bush raisins between them. Rintje: “Can I camp with you tonight”? Wanala: “Wiya! (No!) You cannot. I am too young. Go away”! Rintje got sulky then. He turned his back on Wanala and ran off into the bush. This was an early example of something most of us know about – the classic ‘knock-back’. The linear work reflects Linda's country around lake MacKay in Western Australia and the undulating sandhills that dominate it. In the early ninteeen forties the Pintubi People slowly started to walk away from their homelands, being influenced by one of their leaders, Nosepeg Tjupurula. Nosepeg had already experienced what the whitefella world was like. He appeared in several movies during his time ‘outside’ and so did Linda’s step-father, Shorty Lungkata Tjungarrayi (Blue Tongued Lizard Man). Shorty, who had worked for the army during the second world war, also knew something about what life was like ‘over there’. In 1945, he decided to make the long journey east to the Haast Bluff Lutheran mission with his family. The walking party consisted of her step father, Shorty Lungkata Tjungarrayi, Linda’s mother Wanala Nangala and her two siblings. Walking behind them was the Walpiri witch doctor, a skinny old man and his two wives, both widow women. The family had him along as their medical advisor. Haasts Bluff was many miles to the east of where they were, the high sand hills of the Desert had to be walked over first, and this was difficult, because they lie in a north-south direction. Linda has never forgotten this part of the trip. ‘it was up and down walking all the way. After several weeks of walking they arrived at the mission. They were greeted with gifts of clothes, flour, white flour and meat. Linda went to the mission school where she learned the main tenets of Christianity, one of which was the Birth of Jesus, involving the three wise men from the East. She likens them to the three most influencial men in her early life – her father Rintji Tjungarryi, her step father Shorty Lungkata Tjungarrayi, and her Uncle Tjarli Tjungarrayi. In some of her 'Three Wise Men' paintings, the three men are portrayed by their Ancestral totem the Kangaroo; bringing the two belief systems together on the one land. Windmill at Mt Liebig – First Encounter. This is the story behind Linda Syddick's Windmill paintings. Linda was born in the Gibson Desert at Lake MacKay, in 1937. At the age of eight, she walked out of the desert with her family. The party consisted of her step father, Shorty Lungkata Tjungarrayi, her mother Wanala Nangala and two siblings. In 1937 Linda and her mother, stepfather and family travelled from Lake Mackay in the Gibson Desert all the way to Haasts Bluff on foot. Walking behind them was the ‘skinny old man’ the Walpiri witch doctor, who the family brought along as their medical advisor, because he knew everything about everything! They walked toward the East which meant walking up and down over the high sand hills, which ran north and south. When they got to Mount Liebig, they saw their first ‘white feller thing’. It was a windmill, built by Southern Cross Windmills in the early ninteeen forties. At first, the family was frightened but Shorty knew what it was because he had been working for the Army during the war. He explained to them that this whirling thing was harmless and was used for making water. So it became alright. Later on the old witch doctor caught up with them but was so tired from walking that he fell down and went to sleep without seeing the windmill. When he woke up, it was a different story. He sat up, rubbed his eyes and saw the noisy apparition standing before him. He began shouting ‘Mamu Mamu!!! this is a devil spirit, come to kill us!”. He started throwing his spears at it and but they bounced off with no effect. He then threw some magic stones at it, but nothing happened. The ‘thing’ kept whirling its arms around, making a terrible noise. The poor old man then fell sobbing to the ground still muttering Mamu Mamu!! Shorty came to his side and told him not to worry that this was a good thing, made by white fellas to get water out of the ground, for animails and people to drink. He showed him the pool of water at the base of the windmill. After a little more talking he got the old man to drink from the pool and finally the witch doctor understood that this was a good thing.